A good leader craves new ideas! A steady stream of new ideas will ensure that today’s leaders stay at the top of their game. However, finding the time to do the necessary reading can be difficult. That’s why we put together a list of carefully selected books and read them from cover to cover FOR YOU. On the Bookends Bookclub website, you will find an interview with each author that is, in essence, a tour of the book. Additionally, many interviews have an accompanying discussion guide to jump start a conversation with your leadership team. Have them listen to an interview and then use the discussion guide for a lunch ‘n learn. The discussion guides are geared to the interview. Reading the book is optional. To see the selection of discussion guides, click here to go directly to that section of the website. All of our interviews are also featured on iTunes as a podcast. Take a look at the latest podcast from Bookends! For more great interviews and discussion guides on topics of communication, leadership, management, relationships, self-improvement, and training, please visit the Bookends Bookclub website. George is a professor of management practice at Harvard Business School where he has taught leadership since 2004. In True North Groups, we are reminded that all too often we find ourselves forced to confront life’s challenges on our own. What we need is an intimate group with whom we can examine our beliefs and share our lives. 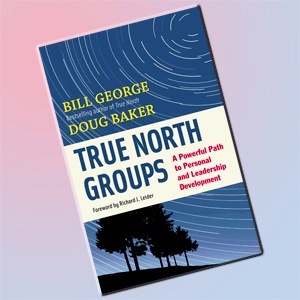 For the past thirty-five years, Bill George and Doug Baker have found the answer in True North Groups — small groups that gather regularly to explore members’ greatest Challenges.